The excitement was in Warsaw Mayor Joe Thallemer’s voice as he spoke at the Warsaw Board of Public Works & Safety this morning about the city’s bike-walk program now being developed. The B.O.W. granted approval for the application of a K21 Foundation grant in the amount of $24,000 that would be used to move forward with the project. According to Thallemer, the city will be developing bicycle lanes along Smith Street as the first step in what is intended to be a more extensive project to bring bicycle friendly travel means to Warsaw. With the $24,000 grant the city hopes to get from the K21 Foundation, they intend to clearly mark bicycle lanes along Smith Street after the street under goes a repaving project in the next few months. The grant will also allow for the purchase of more than 55 signs, and the necessary hardware to erect those signs, that will be used to clearly let both motorists and cyclists know where the shared section of road will be and where the designated bike lanes will be. The first phase of the project would again focus on Smith Street. “While it connects of a lot of things – the Y, the fairgrounds and (Lakeview) middle school – it isn’t a main road so we’re kind of viewing it as a pilot program,” said Tim Dombrosky, Warsaw’s assistant city planner. Along with the bike path and signage, Dombrosky said there will be also be destination and directional markers posted. Those will guide bicyclists to nearby locations and attractions such as Winona Lake, the fairgrounds and even the downtown area with directional markers and distances. The bike-walk program will begin being heavily promoted on May 20 during the Fat & Skinny Tire Festival in Warsaw. After that, informational displays will be located at a number of other summer events including First Friday celebrations and the Kosciusko County Community Fair. In a related matter, the city got word it was approved for a $50,000 grant that will allow for the hiring of R.W. Armstrong & Associates, an Indianapolis-based firm. R.W. Armstrong & Assoc. 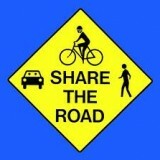 will serve as the consultant for the bike-walk program development. The company’s consulting efforts will focus on everything from development to safety. • The B.O.W. agreed to the closure of Center Street, from Buffalo to Lake, every Saturday, beginning May 5, and running through the end of October, from 7 a.m. to 1 p.m. for the Kosciusko County Farmers Market. The farmer’s market hours are 8 a.m. to noon each Saturday. • Center Street, from Buffalo to Indiana streets, will also be closed from 5 p.m. to 11:30 p.m. on Friday, May 18, for the Fat & Skinny Tire Festival in downtown Warsaw. • Paula Bowman, representing the First Friday committee, noted that tonight’s activities will focus on a 1950s theme. The Sock Monkies will perform on the downtown stage from 6 p.m. to 9 p.m. and special appearances by Lucy and Elvis are slated. Approximately 45 vendors are scheduled to be on hand for tonight’s activities that will also feature an icon look-alike contest and the unveiling of the Habitat for Humanity rain barrel projects. There will also be a surprise at the center stage at 7 p.m. The B.O.W. consists of Thallemer and Warsaw Common Council members Charlie Smith and Jeff Grose. The next meeting will be held at 10:30 a.m. Thursday, May 17, in the Warsaw Common Council chambers.